Whispers from Wildwood: Learn to Laugh at Yourself! 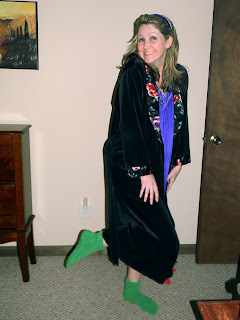 I'm constantly taking my house coat off & on! Yes, young ladies....that's what you have to look forward to after 40!!! You can't see it well in this picture, but I also have a blue (Patriot Blue, I might add) headband on. Needless to say, it does NOT match this purple gown or the green socks. But I always grab it to pull my hair back from my face when putting my makeup on. There's nothing worse than trying to put on mascara with your hair hanging in your face! Lucky for you, I already had my makeup on when this was taken.....I'd hate to scare you to death with a before shot - ha! But you know what? We really need to learn to laugh at ourselves. I'm a little surprised that I even put this picture on here because I am very vain :( So vain that I probably would not have put a picture on here of me without makeup....I know....it's sad :( I shouldn't be that way. I'm over 40. I know who I am and consider myself to be a pretty secure person. I have a loving husband and I'm not trying to impress anyone, although, I'm sure he would much prefer to see me looking a little different - ha ha! Someone once said that "laughter is the shock absorber that eases the blows of life." How long has it been since you've had a really good laugh? God created you to experience great joy. You were made to laugh. You weren't designed to be saddled with unending days of worry, stress, and dreariness. Laughter gives your heart a lift, and frees you to recognize and appreciate the incredible things God has done for you. Shake off the weight of your daily burdens and ask God to give you a really big laugh. Even if you are laughing at yourself! I LOVE THIS, You look so cute !! !